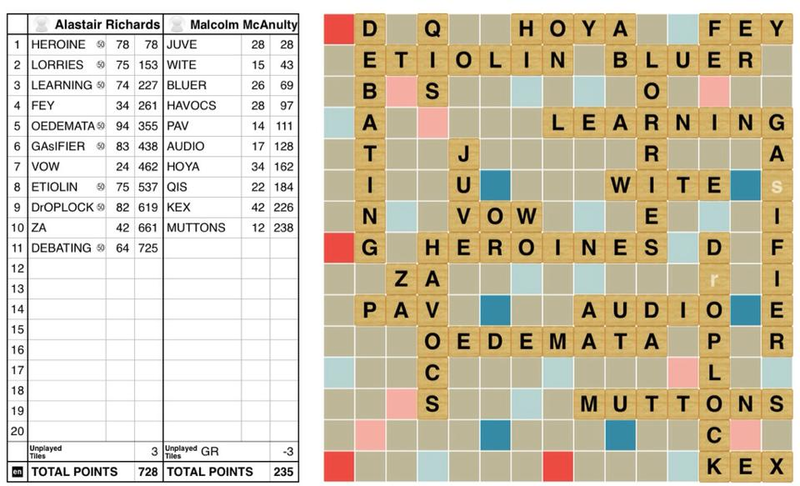 This page lists various official sanctioned records achieved in competitive SCRABBLE® play in North America and overseas. The records in each category are classified further based on the environment (tournament or club) and by the dictionary used (OWL or CSW, ignoring the specific edition). In the words listed, lowercase letters stand for blanks and paranthesised letters stand for tiles already on the board. An asterisk (*) means that the word is a phoney or that the score is known to include phoneys. An octothorp (#) means that the word is acceptable in CSW but not in OWL. A question mark means that some detail of the record is unknown or questionable. All records are subject to revision as appropriate. Any scoring and score reporting errors are corrected before considering a play or game for a record, regardless of whether such errors were corrected in tournament standings or not. To submit a new record, please provide all available documentation for the record to the Ratings and Recognition Committee's record admin. See also our more general article about SCRABBLE History. 876 Hasham Hadi Khan August 23, 2014 Sri Lanka 6th Sri Lanka Open Scrabble Championship. Officially reported as 876-151 victory over Matheesha Da Silva. One news report gave the winning score as 878, and listed words played GRUNTLES, SHERIAT, RETSINA, HEADERS. 546 Richard Ross 702 156 December 29, 1990 FL Florida State Champs. This category excludes games where either player received a time penalty. The theoretical maximum (using either OTCWL or SOWPODS) is 128 for MUZJIKS without blanks. 124 BEZIQUE Joan Rosenthal 1997 OSW? In NASPA play, twice the value of leftover tiles is added to the score of the closing player. In international play, the value of leftover tiles is subtracted from the player's score and added to the closing player's score. Records in this category have not been kept systematically, so there could be many higher scores. 143 TRAPEZO(ID) Shan Abbasi September 23, 2012 Toronto, ON Also a closing play. Ties in this category are broken by the number of tiles played.